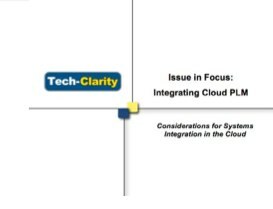 Issue in Focus: Integrating Cloud PLM: Considerations for Systems Integration in the Cloud offers advice and insight on the integration questions companies face as they explore the applicability of Cloud PLM for their business. The report discusses existing issues such as what to integrate and how to define roles for different systems. It also analyzes new considerations that are unique to integration cloud solutions, taking lessons from more mature cloud enterprise ecosystems such as CRM. What should I integrate with PLM? Which solutions are responsible for which data? What level of integration do I need? Data only? Process? Bi-directional? Can I integrate cloud applications to the ones behind my firewall? What new integration considerations do cloud applications bring? Can I take advantage of cloud business benefits in integration? For those that have experienced challenging integration projects in the past, don’t be afraid to read on. Integration projects of the past don’t necessarily reflect what will happen now. Today’s solutions are easier and more affordable to integrate. In fact, business people and engineers can play a much more active role in integration than ever before, although it’s always important to keep IT in the loop. 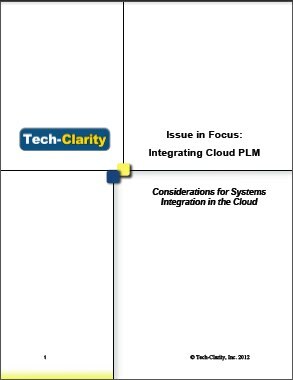 This paper provides insight into integration questions to help companies evaluate the cloud computing opportunity in PLM. As in other aspects of cloud, the good news is that others have addressed integration in the cloud, paving the path for PLM.